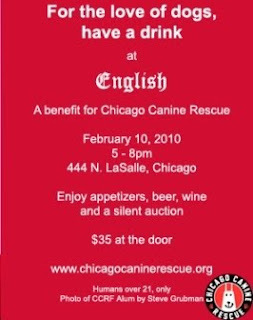 Attention dog lovers and partygoers: support the Chicago Canine Rescue 5 p.m. - 8 p.m. Wednesday, Feb. 10 at English (444 N. LaSalle St., Chicago; 312-222-6200). Indulge in appetizers, beer, wine and a silent auction for just $35 at the door. This event is for partygoers 21 and up only. For more information, visit http://www.chicagocaninerescue.org/. This blog post is party of Kurman Communications' Free Release Tuesdays series. Are you a non-profit or charity with an upcoming event? Let us help promote it with our new service, FRT- Free Release Tuesdays.